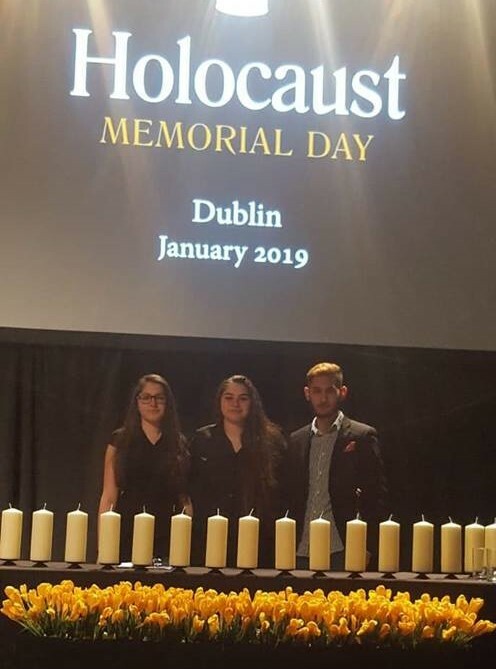 Bianca Paun, representing Pavee Point’s Roma programme, addressed the Holocaust Memorial event in the Mansion House to talk about the experience of the Roma people at the hands of the Nazis. The Holocaust known as Parajomas in the Romani language meaning ‘the devouring’ saw an estimated 500,000 Roma murdered by the Nazis. Damaris Paun and Alexandru Petrovici, also of the Roma community in Ireland, lit candles of remembrance during the ceremony. The importance of commemorating the Holocaust was highlighted in a UK survey, published this week, which showed that 1/20 UK people don’t believe the Holocaust took place. The poll also found that one in three people knew little or nothing about the Holocaust and an average of 5% said they had never heard of it. Another survey published this year showed that at least 3 Holocaust victims were born in Ireland. Isaac Shishi, Ephraim Saks and his sister Lena Saks, were all born in Ireland, but their families returned to Europe when they were children. They were among the 6 million Jews killed in the Holocaust. The Dublin event was organised by the Holocaust Education Trust Ireland, the Department of Justice and Equality and Dublin City Council.